German composer and virtuoso organist (21 March 1685  28 July 1750) whose works represent the culmination of the Baroque Music era and whose death is generally considered to mark the point of transition into the Classical era. Bach, Mozart, and Beethoven are seen as the three main contenders for "Most Sublime Music in Western History," and not without reason. Though today he is considered one of the most influential composers in history, in his lifetime he was better known as an organist than a composer; particularly towards the end of his career, his work was deemed outdated by his contemporaries. He did maintain Cult Classic status among professional composers who studied his work for technique, including such admirers as Wolfgang Amadeus Mozart and Ludwig van Beethoven. But among the musical public he was generally not seen as one of the great composers until his works were re-popularized by composer Felix Mendelssohn in the early 1800s, and has since been Vindicated by History. Toccata and Fugue in D minor, BWV 565,note "BWV" stands for Bach-Werke-Verzeichnis, the standard catalogue of Bach's complete works. the opening of which has become a Standard Snippet for Ominous Pipe Organ moments. Here 's the whole thing played on the most awesome pipe organ in Australia.note However, there has been some debate as to whether he wrote the piece at all; it has a number of stylistic anachronisms that suggest it may have been written after 1750. Another school of thought holds that it may have been originally written for violin (possibly by Bach but likely by another unknown composer), and then transcribed to organ by Bach. The Well-Tempered Clavier, BWV 846893, two sets of twenty-four preludes and fugues, a prelude and fugue in every key in each set. The very first prelude, in C major, is something you might recognize . note A couple hundred years later, French composer Charles Gounod wrote a countermelody to it with the text "Ave Maria"; this became very famous as well and sometimes gets incorrectly attributed to Bach himself. The Mass in B minor, BWV 232, and the St. Matthew Passion, BWV 244, two breathtaking works that are cornerstones of Western sacred choral music. The six Brandenburg Concertos, BWV 10461051, used widely in period dramas and various other works. The harpsichord solo from the fifth concerto could quite reasonably be considered the great-great-great-grandfather of metal. The second, with its high, treacherous trumpet part (played in Bach's day on a valveless instrument , no less) is the first piece of Earth music aliens will hear should they manage to acquire and decipher one of the Voyager golden records . Some suggested having only Bach on the record; Carl Sagan said "that would just be showing off." "Air on the G String", the colloquial title given to the 2nd movement of Bach's Orchestral Suite No. 3 in D major, BWV 1068.note The nickname comes from a particularly famous arrangementinvoked by August Wilhelmj, which transposes the melody down a ninth so that it can be played entirely on a violin's lowest string, which is tuned to G. Even if you don't follow classical music, and don't know Bach from Bono, it's a certainty you've heard it many times as background music in movies, TV shows, and commercials. A strong contender for "Most Sublimely Beautiful 5 Minutes of Music Ever Composed." The Six Suites for Unaccompanied Cello, BWV 10071012, are some of the most widely known cello pieces ever. The prelude to the first suite is the best known from them. Pretty good considering there isn't even an original copy. "Jesu, Joy of Man's Desiring", a melody used for two movements of the cantata Herz und Mund und Tat und Leben, BWV 147, and probably Bach's most well-known cantata-based piece of music.note That said, Bach did not write the words that are usually sung to the tune in English; they are a rough translation of the first verse of the hymn "Jesu, meine Seelen Wonne" by early 20th-century English poet Robert Bridges. Schweigt stille, plaudert nicht, BWV 211, also known as the "Coffee Cantata", a satire of the then-moral debate over coffee consumption. "Sheep May Safely Graze", the ninth movement of Was mir behagt, ist nur die muntre Jagd, BWV 208, a.k.a. the "Hunting Cantata", which is often used at weddings alongside Lohengrin and Mendelssohn. In addition, Bach's church gig at Leipzig's Thomaskirche required him to perform a sacred cantata on every Sunday and feast day of the Lutheran calendar. He composed at least three complete yearly cycles of cantatas — over 300 works (1/3 of which, alas, are lost). The variety of form and style, mastery of polyphonic vocal writing, and breadth of instrumental tone color found in these works were unrivaled by his contemporaries. Despite Bach's virtuosity and deep spirituality, he was also refreshingly human. He was once rebuked for stretching a brief leave of absence into several months without apology or explanation. He often battled his employers over the duties and responsibilities of his position. As said above, he also wrote a cantata about a man's concern over his daughter's consumption of coffee (he was for it, by the way). Then there is the wonderful story of Bach drawing his sword in an altercation with an instrumentalist that he had insulted, calling him a "nanny-goat bassoonist." Interestingly, Bach shares not only a year of birth with George Frederic Handel (who was born a mere 37 days before Bach), but also a possible cause of death: they were both unsuccessfully operated on by the same eye surgeon — an "oculist" called the Chevalier John Taylor, often referred to as "the poster child for 18th century medical quackery." The Ace: Frederick The Great gave Bach a tricky chromatic theme and challenged him to improvise a fugue on it. Bach obliged. Frederick asked if Bach could improvise a three-part fugue using the same theme, knowing that Bach probably couldn't. Bach did. Frederick asked if he could improvise a six-part fugue on the theme. Bach replied, in effect, "Leave it with me", and after tweaking the theme to make it easier to work with, wrote exactly that and sent it to Frederick, along with a bunch of other pieces based on the same theme. The collection is known as the Musical Offering and it's regarded as one of Bach's greatest achievements. Bach's devout Lutheran faith clearly inspires his cantatas, chorales, and service music. He was also a master of counterpoint, which can be found in virtually all of his compositions even though it was falling out of fashion in his day for the more spare Early Classical style. And his fondness for drinking coffee inspired the humorous "Coffee Cantata," Schweigt stille, plaudert nicht. According to his son C.P.E. Bach and his biographer Johann Nikolaus Forkel, Bach had a special love for the viola and strongly preferred playing the viola in chamber music. This is quite evident in his music as the viola parts in much of his music are almost equally as important as the violin parts, which was quite odd during the baroque period as the viola usually played backup harmonies to the violin or kept the beat with the bass part. Additionally, Bach lets the viola shine forth in a solo aspect, which was virtually unheard of during the baroque period. His sixth Brandenburg Concerto completely does away with the violin parts, instead using two violas as the soloists, two arias from two separate cantatas ("Ergieße dich reichlich, du göttliche Quelle" from Wo soll ich fliehen hin (BWV 5) and "Ich, dein betrübtes Kind" from Mein Herze schwimmt im Blut (BWV 199)) have a solo viola accompany the vocalist, and finally, Gleichwie der Regen und Schnee vom Himmel fällt (BWV 18) in its original score has the string section composed solely of four separate viola parts. Baroque Music: One of the most famous composers of this era; his pieces are often seen as the archetypal Baroque sound. Many people claim the genre died out with him, too. Cantata: Composed a lot of them. Christmas Songs: The Christmas Oratorio and several cantatas intended for Christmas Day; "Jesu, Joy of Man's Desiring" is sometimes used like this. Dead Artists Are Better: Bach was better known as an organist than a composer during his lifetime. It was only when Felix Mendelssohn rediscovered his compositions in the 1800s that Bach became widely known as "The Father of Classical Music." Dawn of an Era: 1685, the year Bach was born, is widely held to be the year when tonality in music (as we know it today) was found its footing, thanks to Arcangelo Corelli. 1750, the year Bach died, is widely held to be the year when the Baroque period in music history ended and the Classical period began. God-Is-Love Songs: Being a devout Lutheran who was mostly employed by churches, he wrote a lot of religious pieces for church performance, among them the Johannes Passion, Matthäus Passion, the Mass in B Minor and, most spectacularly, over 300 sacred cantatas, of which about 200 survive. These include many of his most famous pieces, such as "Jesu Bleibet Meine Freude" (given English words as "Jesu, Joy of Man's Desiring"), which is a chorale from cantata BWV 147 Herz und Mund und Tat und Leben. This trope is averted inasmuch as Bach's cantatas aren't disguised as secular works; they're completely up-front about their religious content — sample titles (translated) include Christ lay in Death's bonds, God's time is the best time of all and Praise the Lord, the mighty king of honour. But then again, they're very often performed in secular concert halls where you wouldn't expect much religious content. Holy Pipe Organ: Bach composed extensively for organ, and many of his pieces (i.e. the chorales) had Christian themes and were intended to be played during worship. The "Great" Fugue in G minor (BWV 542) is quite soft and quiet for its first half. In the second half, the piece shifts toward being slightly more upbeat and louder, but still not too loud. Then at the very end, the piece shifts toward being loud and angry for a few seconds, contrasting with the light and soft qualities of the rest of the piece. Quite a few of Bach's organ fugues end this way. Apparently, Bach loved using the Picardy third. Perhaps Bach's most jarring example comes from the deceptively peaceful Adagio in C Major (BWV 564). Not only is the Adagio not actually positive-sounding, as its name would suggest, it has a short but incredibly aggressive ending portion that can only be described as Ominous Pipe Organ taken Up to Eleven. And, of course, the last chord is a Picardy Third. Listen here. Mundane Made Awesome: The Art of Fugue is literally this trope, taking a simple subject and crafting fourteen fugues and four canons from it, in increasing complexity, to show the contrapuntal possibilities that could arise from a single theme. Must Have Caffeine: Schweigt stille, plaudert nicht, BWV 211, A.K.A. the "Coffee Cantata" is the Ur-Example, where the entire plot is driven by coffee. Non-Indicative Name: Unlike every other prelude in the collection of preludes and fugues known as The Well-Tempered Clavier, the Prelude in E-flat major (BWV 852) from Book 1 is actually a fugue in itself. Ominous Pipe Organ: His Toccata and Fugue in D minor has become a cliché of Halloween music, when played on a organ. A strange case. From Bach's death until his music's rediscovery, historians and musicians considered his sons' accomplishments more noteworthy than his; Mozart said of Bach's second son C.P.E. Bach, "He is the father, we are the children." This was historically justified, in that Bach's sons were considered to be more innovative and experimental than their father. Things changed when composers decided that they wanted some of that old-school contrapuntal wizardry that Bach had, but which his sons weren't interested in. Another example would be that of his good friend Georg Philipp Telemann, who was more or less a celebrity composer in his day. In modern times, this is reversed with Bach being considered one of the best, if not the best, composers while Telemann is generally considered to be just good or average and isn't too well known outside of the early music music scene. Passion Play: The St. Matthew Passion, of course, and also a lesser-known Passion from John's gospel. Progressive Instrumentation: A notable characteristic of Fugues and Inventions is voices that enter one at a time, copying the melody of the instruments that played earlier. This could be done with multiple instruments, or (if your organ skills are up to the task) adding multiple voices on the same instrument. Real Men Love Jesus: A devout Lutheran who wrote a lot of church music. Signature Style: The fugue . Not everything he wrote was in fugue form, but he clearly loved them; his last, great, unfinished work is a collection of them, all originating with variations on the same basic theme, called The Art of Fugue. Strictly Formula: Necessary, but subverted: he had to compose a new church cantata just about every week for three years, but within the canatata form they vary enormously in mood and tone, and Bach scholars tend to consider his cantatas to be the foundation of his achievement. Sincerest Form of Flattery: Name any great composer of Classical Music. Odds are that, at some point in their education, they studied from and imitated the works of J.S. Bach. Bach's fugues and chorales are still required studying in most music conservatories to this day. Trope Codifier: He didn't invent the fugue, but boy, did he codify it (see Signature Style, above). Given that he could improvise three-part fugues on request, this is not surprising. Some musicologists argue that his music goes some way towards codifying Western harmonic music in general. P.D.Q. Bach owes his artist's name to Bach. The story goes that P.D.Q. was the 21st and least well-regarded of Bach's 20 children, disowned by the Bach family because his music was too stupid. Fantasia starts off with Toccata and Fugue in D minor, which, true to the music's fashion, is a series of abstract images. Il était une fois...... L' Homme started off with Toccata and Fugue in D minor as its theme music. The basis for the Gyruss theme song. "Bach onto This " could even count as a Homage. A Touhou music arrange for Kanako Yasaka's theme, Suwa Foughten Field, begins with the opening. "Golbez, Clad in Darkness" from Final Fantasy IV quotes it as well. Eurobeat Brony's "Discord" uses the Fugue for its intro. The Civilization series have J.S. Bach's Cathedral as a Wonder you can build. In Civ. II, the cutscene that plays upon finishing its construction features Toccata and Fugue in D minor as background music. Wendy Carlos made a career out of covering Bach's music in Electronic Music, starting off with Switched-On Bach. Apollo 100's song "Joy" is a rock version of "Jesu, Joy of Man's Desiring." The Byrds' song "She Don't Care About Time" has a guitar solo based on "Jesu, Joy of Man's Desiring". Muse's "Plug-in Baby" starts off with the opening of Toccata and Fugue in D minor. The Kinks' "Wicked Annabella" briefly quotes "Jesu, Joy of Man's Desiring" in a bass fill. Sweetbox's Everything's Gonna Be Alright is based around "Air on the G String", from Bach's Orchestral Suite No.3. Live versions of "Heartbreaker" by Led Zeppelin often include a snippet of Bach's Bourrée in E minor. Similarly, the Jethro Tull song "Bourrée" opens with Ian Anderson playing Bourrée in E minor on the flute. Megadeth's "Last Rites", based on Bach's Toccata and Fugue in D minor (BWV 565). "Repent Walpurgis" by Procol Harum contains an excerpt of Prelude No. 1 in C major from Book I of The Well-Tempered Clavier. Procol Harum's greatest hit was "A Whiter Shade of Pale" - based on the Air from Orchestral Suite No.3. Symphony X samples, among other pieces, Bach's Mass in B Minor in "Divine Wings of Tragedy". Further on the album V-The New Mythology Suite we also hear excerpts from Bach's Concerto for Harpsichord in D minor (BWV 1052) and the cantata Ich habe meine Zuversicht (BWV 188). Fitting the subject of the song, Sakanaction's "Bach no Senritsu o Yoru ni Kiita Sei Desu" ("Because Of Listening To Bach Melodies At Night") includes a short Bach snippet played on the piano. 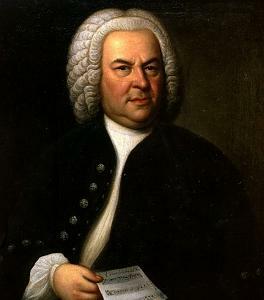 Bach has a cameo appearance in Epic Rap Battles of History during the duel between Justin Bieber and Ludwig van Beethoven. The End of Evangelion features both "Air" and a Lonely Piano Piece version of "Jesu, The Joy Of Man's Desiring" in its soundtrack. "Air" is even one of the titles for the first half of the film. The long fade-out of The Beatles' "All You Need is Love" includes a snippet of Two-Part Invention No.8. Shin Megami Tensei: Devil Summoner plays an organ version of Two Part Invention No.13 as background music in the Hotel Goumaden. Its sequel, Soul Hackers, features a piano version in the same location, but only after you perform a fusion or let the first piece of music finish. Dirk Gently's Holistic Detective Agency has a plot point where, thanks to a twist on You Will Be Beethoven, J. S. Bach never actually existed; Prof. Chronitis stole some unearthly beautiful alien music and planted it in the Baroque era using Bach as a pseudonym. In real life Bach was also Douglas Adams' favorite composer; he was especially fond of "Ach bleib bei uns, Herr Jesu Christ" (BWV 6) which he listened to while writing, considering it an "absolutely perfect" piece of music.